It's Spring - Time To Enjoy More Raw Food! Increase raw food to at least 50% as the weather get warmer. Despite the recent rain here in northern California, the weather has been getting warmer and when it's sunny, the temperatures can be in the upper 60's or higher. When this happens, I start opting for raw smoothies over oatmeal in the morning and for salads over hot soups for lunch or dinner. 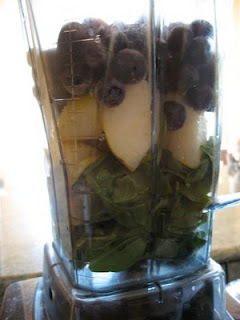 This morning I made a smoothie from blueberries, pears and spinach! Whether you're vegan, aspiring to be a vegetarian or a card carrying carnivore, eating more raw fruits and vegetables will benefit your health. You'll find that when you increase the amount of fruits, vegetables and natural unprocessed foods you eat, you will start to eat less dairy, meat and non-nutritious processed foods without feeling hungry or deprived. Your diet will become more alkaline which helps your body more easily maintain its optimal and life-critical pH balance. You'll obtain more of the vitamins and phytochemicals that are diminished or destroyed during cooking and benefit from the extra fiber found in fruits and vegetables. Here are some easy ways to get your raw food consumption up to 50%. * Start the day with a smoothie of raw fruits, raw nut milk and some greens like the blueberry, pear and spinach smoothie pictured above. The combinations of fruit and veggies are endless! * Or have a fruit salad with your favorite fruits and berries topped with raw nuts, seeds, coconut or Ezekiel cereal. Mixed Berry and Mango Breakfast Salad. * Enjoy a raw soup like Avospacho or Curried Lentil Soup. * Make a huge, yummy salad as part or all of your meal like Asian Coleslaw or Waldorf Salad. * Make raw dips and Raw Crackers like Guacamole and Raw corn chips or Veggie Seeded Crackers. 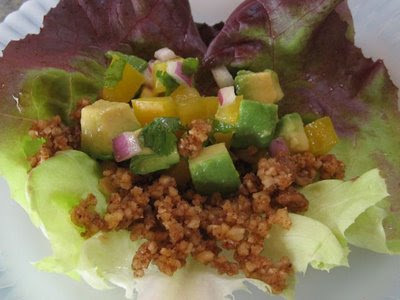 * Enjoy raw entrees like Raw Tacos or Spaghetti and Meatballs. 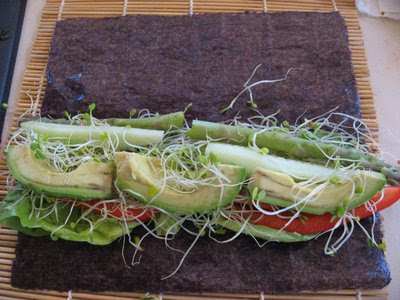 * Make Raw Sushi or Veggie Wraps. Making raw sushi is easy and fun! * Make delicious, high omega-3, Chia Pudding. We can eat this every night it's so good. Mix it with berries or other fruit or just eat it on its own. Everyone I've turned on to chia pudding loves it! * Enjoy a raw crisp like Peach and Blueberry crisp. 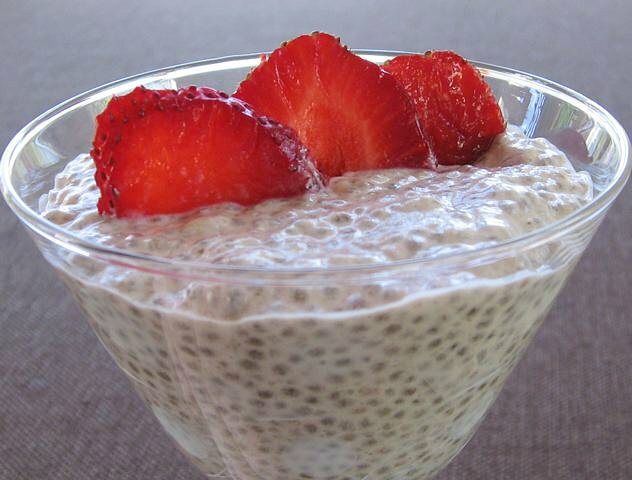 You'll love this creamy chia pudding for dessert! So navigate the site. I've got 100 posts on raw food to look through. 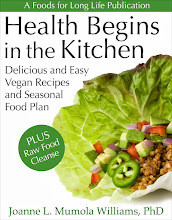 Also, you might enjoy reading, Raw Food Diet - How Raw Do You Need To Be? How To Make The Most Nutritious Regular And Chocolate Nut Milk - It's Raw, Vegan And Gluten Free! A mixture of nuts provides a highly nutritious milk! Follow Foods For Long Life on FACEBOOK. We love to make our own milk. Whether it's using our SoyaPower Plus to make soy milk or using our Vitamix blender to whip up raw nut milk, it's always very gratifying to know exactly what I'm serving my family. Most people make milk from a single nut but I've developed a mixture of nuts that provide a great selection of nutrients. Most nuts provide manganese, copper, magnesium, phosphorus, thiamin and omega-6 as well as antioxidant phytochemicals. But in addition to that, I've selected particular nuts that deliver other important nutrients - almonds, English walnuts and Brazil nuts. Almonds provide lots of vitamin E.
Walnuts are rich in ALA omega-3 fatty acids. Brazil nuts are packed with selenium, a natural antioxidant. This Chocolate Milk is Good For You! By adding raw cacao, a touch of vanilla and more stevia to this milk, you get all of the heart healthy advantages of the rich flavanols in chocolate without the sugar and the calories. So go ahead and enjoy that chocolate milk! See recipe below. Soak all nuts together in filtered water for 6 or more hours. Rinse well after soaking. Place nuts, 4 cups filtered water, stevia and salt in a Vitamix or other high-speed blender. Blend until smooth. I'm always amazed at how white nuts become when blended! 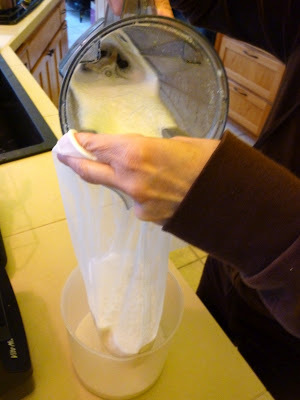 Strain nut milk through a fine mesh strainer or nut bag. Pour milk into nut bag. You can find nut bags on the internet or in your local health food store. Nut residue can be used in baking or in raw cookies. I'll think up a recipe! Refrigerate until needed and stir before serving. Milk will keep for several days. Per serving: Because different blenders and straining techniques yield different amount of pulp vs. milk, the exact yield and nutritional analysis is not possible to accurately calculate. Return strained nut milk to blender and add cacao, vanilla and stevia. Blend until smooth. Yumm, chocolate milk that's good for you! Spaghetti Squash "Aglio E Olio" Con Piselli -Vegan, Gluten Free And Low In Calories! Spaghetti squash and peas in a classic "aglio e olio" sauce. Once a week my grandmother would make us "piselli con pasta" or peas with pasta. Only with her Neapolitan dialect she pronounced it "pizella ga bast". It wasn't until years later while studying Italian at the University of Texas did I learn the correct way to say it. It's kind of funny that a girl from Brooklyn being raised by a Neapolitan grandmother would have to go to Texas to learn how to speak proper Italian! But that's exactly what transpired. In any case, making peas and pasta always warms my heart because it makes me think of my sweet grandma. Aglio e olio is a simple Italian sauce with a base of extra virgin olive oil with fresh garlic and crushed red pepper. The first time I made spaghetti squash I was amazed at how the strands of steamed squash turned into spaghetti. But to get nice strands, you have to be careful no to overcook it or it will turn to mush. I like to steam it for only about 15 to 18 minutes. Steam spaghetti squash in a large pot with a few inches of water. Using a fork, carefully scrape the squash from the sides. Spaghetti Squash and Peas "Aglio e Olio"
* (Although I usually prefer frozen or fresh to canned peas, I use canned in this recipe because the liquid from the peas makes up an important part of this sauce). Cut squash in half, remove seeds and sprinkle insides with salt. Place in a large pot with several inches of water. Cover and steam until barely fork tender, around 15 to 18 minutes. Do not overcook. When cooked, remove from pot reserving cooking water. When cool enough to handle, gently pull the squash away from sides using a fork, forming strands of spaghetti. Place in a bowl and set aside. In a large saucepan, heat oil on medium low heat. Cook garlic and chili pepper flakes for one minute until fragrant. Add can of peas with their liquid. Season with salt. Mix spaghetti squash in with peas. If dry, add a few tablespoons of reserved cooking water. Top with freshly ground black pepper, if desired, and serve. Per serving: 184.8 calories, 7.5 g fat, 1 g saturated fat, 260 mg omega-3 and 884 mg omega-6 fatty acids, 0 mg cholesterol, 5 g protein, 25.8 g carbohydrates, 5.6 g dietary fiber and 657 mg of sodium. This gluten free salad is made with Hawaiian fruit and nuts. Doug and I have always loved Hawaii. It was the destination of our very first vacation together. We just got back from Maui 2 weeks ago and agree, it's still our absolute favorite place on the planet. One of the reasons I love Hawaii is I get to eat all the pineapple and papaya I want. And those wonderful macadamia nuts! What can I say. So when we got home I decided that I had not gotten enough of these wonderful foods so I headed out to the grocery store. I was lucky enough to find Hawaiian papaya and pineapple and decided to make this simple salad which immediately took me back to Maui. I bought some macadamia nuts while we were there and brought them home. These, along with some coconut, were added to the fruit salad. Given the cost of imported papayas, pineapple and macadamia nuts, this salad is pretty pricy but it's quite a bit cheaper than a trip to Hawaii! Place all fruit in a bowl with 3/4 of the coconut and gently toss to combine. Top with macadamia nuts and remaining coconut and serve. Per serving: 297.3 calories, 16.4 g fat, 5.2 g saturated fat, 0 mg cholesterol, 98 mg omega-3 and 264 mg omega-6 fatty acids, 3.7 g protein, 39.7 g carbohydrates, 7.2 g dietary fiber and 8 mg sodium. This salad dressing's beautiful color is enhanced by a secret ingredient! Today's recipe uses 2 products that I recently discovered. One is So Delicious Coconut Milk Beverage (the one found in the refrigerated section of the grocery store - not in a can) and Living Harvest Organic Hemp Oil. I've enjoyed products from both of these companies in the past so I was excited to try these. This creamy beverage has only 80 calories per cup. The unsweetened version has only 50 calories. Both contain MCFAs - medium-chain fatty acids. Hemp oil has a perfect balance of omega-3 and omega-6 essential fatty acids. Living Harvest hemp oil is cold pressed and made with raw hemp seeds. So why did I need these products just to make a salad dressing? Let me share the nutritional adventure that lead to this. I love poppy seeds but like many nuts and seeds, they are high in omega-6 and have very little omega-3. In fact they have a 100:1 ratio of omega-6 to omega-3 which is far from the optimal ratio of 4:1 or less. So I needed something to balance that out. Flaxseed oil would be a natural thought with its very high content of omega-3 but this cold pressed hemp oil has a fresh, nutty taste and makes a better salad dressing. Extra virgin olive oil always makes a good salad dressing but doesn't provide as much omega-3. Each tablespoon of hemp oil contains 2.3 grams of ALA omega-3 in a 3.7:1 ratio with omega-6. As an alternative, you can also mix 1 tablespoon of flaxseed oil with 3 tablespoons of olive oil. My next goal was to reduce the oil - the main ingredient of most salad dressings. Even though hemp oil has beneficial qualities, I wanted to limit the calories. 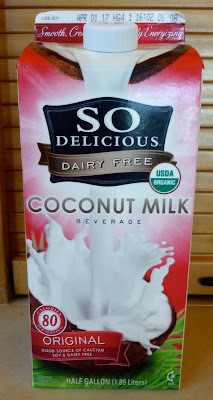 In searching for something that would provide a creamy taste and thicken the dressing, I decided to try So Delicious Coconut Milk beverage. I've never been a big fan of recipes that contain tropical oils and their saturated fats, but this beverage is not that high in fat. And the fats it does contain are MCFAs (medium chain fatty acids) which some claim raise your metabolism and are more likely to be burned as fuel than to be stored as fat. From a pure pleasure standpoint, I've got to say it's one of the best tasting non-dairy milks I've ever had. Besides this dressing, I've been using it in my smoothies and over cereal. Good stuff! Even though mangos are orange, by the time you water them down with oil and coconut milk, the color isn't very intense. So I added a grated carrot! Not only does it make the dressing a beautiful color, but it spikes the dressing with vitamin A providing over 200 IU per tablespoon. Soak medjool date in coconut milk for 4 hours or overnight in refrigerator. Place date, coconut milk, mango, carrot, lemon juice, apple cider vinegar, mustard, garlic, salt and pepper in a high speed blender and process until smooth. Running the blender on low, slowly drizzle in hemp oil until combined. Add poppy seeds for a few seconds to combine. Store in a 1 pint container and refrigerate. Per tablespoon: 27.9 calories, 2.2 g fat, 0.3 g saturated fat, 329 mg ALA omega-3 and 1303 mg omega-6 fatty acids, 0 g cholesterol, 0.1 g protein, 1.8 g carbohydrates, 0.3 g dietary fiber and 24.5 mg sodium. This warm Farro Salad is packed with veggies and is less than 200 calories per serving! Farro, or Triticum dicoccum (it's Latin name), is a whole grain in the wheat family. It is often mistaken for spelt but is actually more similar to barley with its wonderful, chewy texture. Unfortunately it is not gluten free but it is rich in protein and fiber and contains no saturated fat or cholesterol. If you have the time, soak farro overnight. It will shorten the cooking time and reduce phytic acid which can bind important minerals. But for culinary purposes, this isn't necessary so if you forget to soak it, just rinse well and cook it a bit longer. Here's a warm salad with mushrooms and lots of veggies. I cook them all in a single roasting pan so clean up is minimal. Farro is similar to barley with its chewy texture. Roast mushrooms and veggies in a large shallow pan. Rinse farro well and place in a saucepan with salted water. Bring to a boil. Lower to simmer, cover and cook until it reaches the desired texture (30 to 45 minutes if unsoaked). Place asparagus, bell pepper, mushrooms, leeks, thyme, garlic, pepper and salt in a large, shallow roasting pan. Drizzle oil over the vegetables and mix thoroughly. Roast in oven for about 25 minutes stirring the mixture half way through. When done, remove from oven. In a small cup, combine lemon zest, lemon juice, oil and salt. Set aside. Place cooked farro, roasted vegetables, dressing and chopped parsley in a large bowl and mix well. Top with additional parsley or freshly ground black pepper if desired. Serve warm. Per serving. 198.4 calories, 5.3 g fat, 0.7 g saturated fat, 0 mg cholesterol, 9.0 g protein, 31.5 g carbohydrates, 7.0 g dietary fiber and 301 mg sodium.